The Grand Rapids Encore initiative encourages 50+ to use their skills and experience for the good of the community. The five Encore Innovation Fellows manage the program here in Grand Rapids. From web design to writing to community engagement, they cover all the bases to better help older adults find their passions. From left to right: Tera Wozniak Qualls, Shannon Cohen, Jane Royer, Tom Rademacher, and Mary McLoughlin. For many people across the country, retirement brings one common question: What now? Royer and her Encore colleagues Tera Wozniak Qualls, Shannon Cohen, Tom Rademacher, and Mary T. McLoughlin are passionate about encouraging individuals to activate their talents to improve the community. 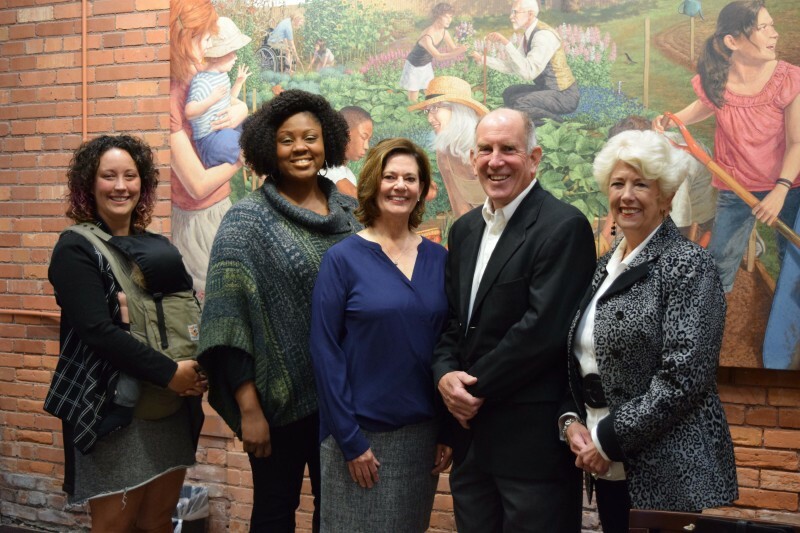 They joined up with the Grand Rapids Community Foundation’s Encore Innovation Fellowship program to grow the initiative here in the city—a movement designed to help people 50 and over figure out what they want to do with the second act of their lives. “Life and experience don’t end or stop being relevant with growing older,” Royer said. Royer, Wozniak Qualls, and partner Encore Innovation Fellows Tom Rademacher, Mary T. McLoughlin and Shannon Cohen recently launched the initiative’s website to make those connections even easier. Now, the Encore Network—in McLoughlin’s words, “a growing group of curious, committed and energized individuals who are discovering, together, what’s possible for that next chapter of their lives”—can reach out more easily to help each other as well as newcomers. The new site includes a calendar of events, a list of Network members, and a series of online forums where people and community organizations can connect, brainstorming ideas, asking questions, and sharing information. Also on the website, Rademacher chronicles the encore journeys of dozens of Grand Rapidians in Our Stories. Some return to instruments that they did not have time to pursue when they were younger; others save libraries or tutor children. One recent article tells the story of Raul Ysasi, a retired teacher who now mentors soon-to-graduate college students as they prepare to become educators themselves. Clicking through the posts is an exercise in inspiration—each story shows how talent still blossoms, and how even the little things can help a community grow. The Encore team believes that collaboration between generations can lead to true innovation and change. “We’ve seen this personally,” Royer said. “The Encore Fellows are diverse in age, so we bring different experiences and perspectives to the table. I truly believe that’s what has made Encore so successful here.” Intergenerational sharing and participation bridges gaps, giving citizens more opportunities—and more ideas—to make Grand Rapids a better place. “Every individual has so much capacity to help our community,” Royer said. For more information about the Encore initiative, visit their new online network website or follow them on Facebook to start connecting. The Grand Rapids Community Foundation also has additional ways to get involved in the community.